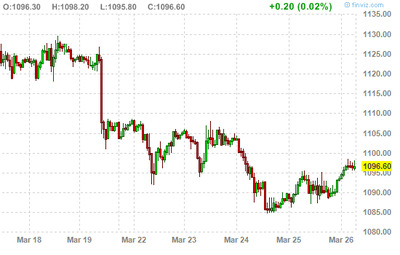 Yesterday we used some juvenile language to describe the selloff in bonds, possibly as a result over US debt fears, but also possibly because everyone is crazy to plow their money into the stock market right now. 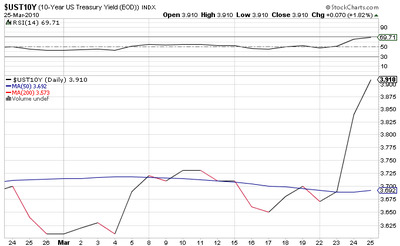 The move up in [yield] coincides with the impending end of the Federal Reserve’s program to support the mortgage market. The Fed has bought $1.25 trillion of mortgage-backed securities, bolstering their prices and thus holding down their yields. In just the past two days, the rate on 30-year Fannie Mae mortgage securities has risen to 4.5% from 4.3%. Once fees by lenders are tacked on, this means mortgage rates above 5%. Thomas Lawler, a housing economist, says some bigger lenders have already raised rates. Some were quoting 30-year mortgages at 5.125% Thursday morning, up from 4.875% earlier in the week, he said in a note to clients. Concerns about the U.S. budget deficit are beginning to hurt the Treasury market, said Steve Rodosky, head of Treasury and derivatives trading at bond giant Pacific Investment Management Co. He said he is increasingly worried about the U.S. fiscal outlook. There is this problem though of: why are people buying stocks if they’re concerned the US government is going to go bust? After all, if Uncle Sam runs into serious trouble it will create an economic crisis in America, and before we get to that, the government will tax the hell out of any profitable corporation. Fears of Greece-style calamity don’t quite work. 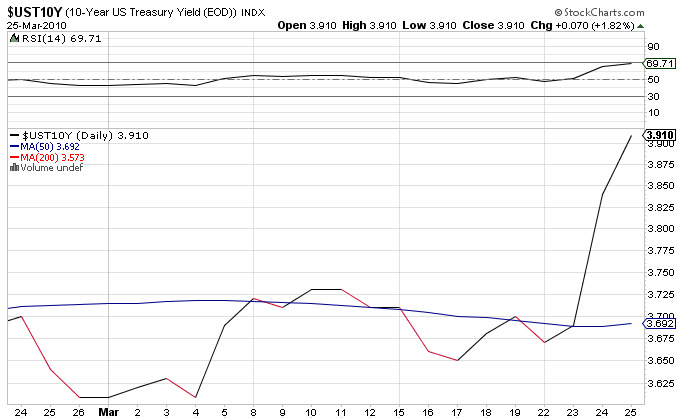 For some more perspective, here’s a month’s worth of 10-year not yields. The move is hard to miss. Finally, we’ll throw in a gold chart, and note that if the bond selloff were really the result of debt fears, we’d likely see a little more on this front, no? Instead the move has been pretty meh.